Where do engineers go online for answers they can trust? 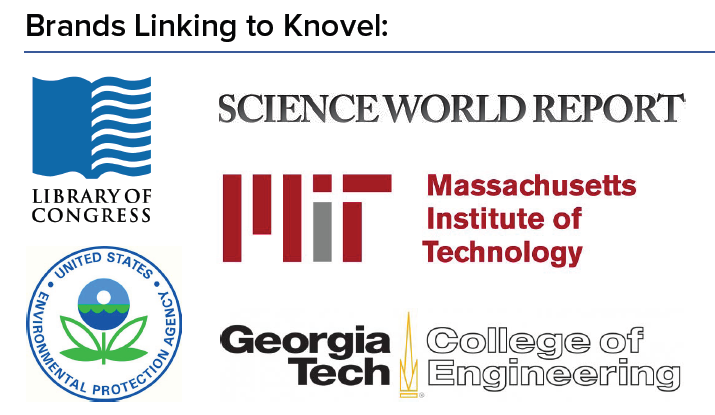 Knovel works with more than 100 authoritative societies and publishers to ensure users have access to the most trusted engineering resources available. 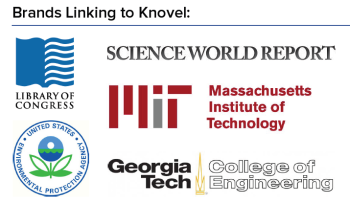 Knovel’s customers are comprised of thousands of engineers at more than 750 organizations worldwide, including leading universities and 74 of the Fortune 500. Knovel is available online via a subscription service, and its product is promoted through the brand’s marketing website why.knovel.com. The company partnered with Brafton to further increase brand awareness, adding accessible and timely news content to why.knovel.com. Amy Burnis, Knovel’s director of marketing and communications, says the updates from Brafton reach new audiences and give engineers a reason to stay connected with the brand. Burnis understood the company could publish shorter content relevant to engineers in its key target industries to expand its reach and build more interactions with existing users. 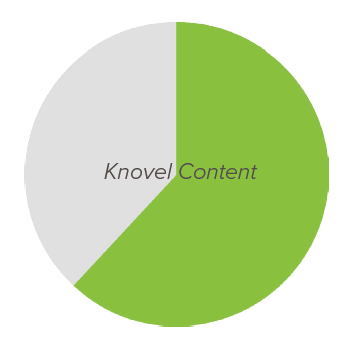 Brafton provided SEO and content marketing expertise for Knovel. 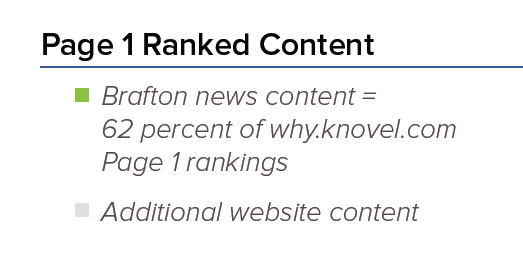 In Q2 2011, Knovel launched Brafton content to provide professionals with ongoing news highlights and insights on industry trends. Brafton worked with Knovel on an Editorial Brief to outline appropriate subject matter for the company’s audience. Burnis emphasized the importance of maintaining Knovel’s integrity as a trusted resource for its customers, so nailing the voice, message and subject matter for each piece on the marketing site was paramount to the strategy’s success. Brafton’s editorial team produces regular articles for why.knovel.com’s news and content section, populating the marketing site with timely and newsworthy posts every day. The content is aligned with Knovel’s target industries, and Brafton’s content marketing strategists offered guidance on content integration to facilitate UX and SEO. Knovel’s regular content helped it get into the News section of Google search. The company now publishes a balanced mix of audience-centric subjects, with each piece tailored for one of its key markets. Burnis is confident the Brafton content meets the standards of her highly educated audience. Knovel and Brafton worked together to build an online community for the engineering world centered on well-written content for niche audiences. The Brafton writers also turn daily articles into authoritative and clickable trend analysis or roundups, including annual features highlighting top engineering jobs for the next 12 months. More, Brafton social strategists distribute the brand’s content on leading social networks for added reach. 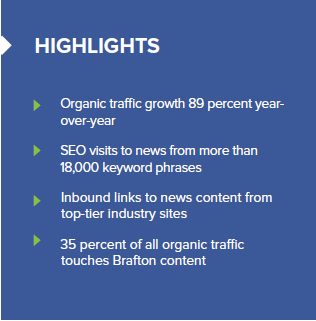 Knovel saw consistent results from its Brafton content strategy throughout the first yearof service with organic traffic for its quarterly marketing site increasing 89 percent year over year. 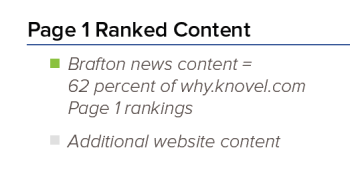 More than one-third of why.knovel.com’s overall organic search visitors (35 percent) engage Brafton news content. Because the company wanted to increase the SEO value and brand exposure for why.knovel.com, it was important for Burnis to see ROI pertaining to traffic upticks, keyword progressions and rising PageRank. Fortunately, Brafton’s custom content helped Knovel achieve these objectives. News content traffic rose 267 percent year-over-year in 2012 because of added exposure through Google News. Presence in less-cluttered search categories enabled Knovel to reach new prospects, and the daily updates also caught the attention of major news outlets that linked back to why.knovel.com’s content in their own reports. In 2012, resources like the Library of Congress, U.S. Environmental Protection Agency (EPA), Science World Report, Massachusetts Institute of Technology and Georgia Tech’s College of Engineering all referenced and linked Knovel content created by Brafton writers. 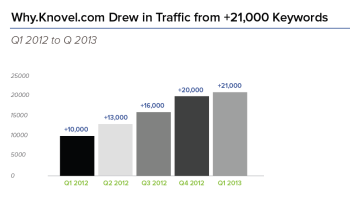 Knovel drew in organic web users to its marketing site from more than 21,000 keywords last year. With many companies hyperfocused on their keyword strategies, Knovel found that having a wide array of content published every day drives organic traffic from countless phrases and terms. Through natural keyword progressions, Brafton content makes up 62 percent of Knovel’s Page 1 rankings, helping the company establish its authority via search. The company drives brand awareness for its core product and educates site visitors with industry-specific news. Unique traffic growth was accompanied by 136 percent increase in returning visits, creating more touch points with Knovel audiences. Knovel has seen great results from its partnership with Brafton, and the company looks ahead to future content opportunities. After seeing traffic increases from its “Top Engineering Jobs of 2012” article, Knovel’s Brafton team will create similar news content around the trends that matter most to engineers. The company looks forward to continuously enhancing its content marketing strategy with Brafton.